In 1209, St. Francis of Assisi obtained from Pope Innocent III an unwritten approbation of the simple Rule, or way of life, he had written for the guidance of his first companions. This earlier Rule was succeeded by a more formal document dating from 1223, which is still used as a guiding set of principles for Franciscan men. The Order now comprises three separate bodies: the Friars Minor (OFM), the Friars Minor Conventuals (OFM.Conv.) 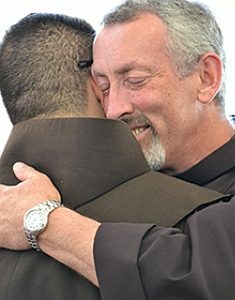 the Friars Minor Capuchins (OFM. Cap). Each group follows the Rule of the Friars Minor, but each one has its particular constitutions and its own leader, or minister general. A fourth body, the Third Order Regular of Penance of St. Francis (aka TORs) is also an integral part of the Franciscan family. The Franciscan friars of St. Barbara belong to the Friars Minor (OFM).